Little turmeric, salt and chili powder to fry the fish . 1. Rub little turmeric , chili powder and salt on the pieces of fish and keep it aside for half and hour . Then shallow fry them . Take them out from the oil . 2. In the same oil , add the chopped onion . Fry until light brown . Add the onion paste and little water . Add the chili, turmeric powder and salt and cook well adding water little by little . Now add the papaya and cook well . Green papayas take bit longer time to get well done , so what I do , I always steam them for 10-15 minutes or until half done . Then I add the papya to the masala and cook . Now add the fish and enough water . 1. As I have mentioned earlier , to save some time , steam the papaya ( not boil ) for 10/15 minutes . Believe me , it saves time without compromising the taste and nutrition . 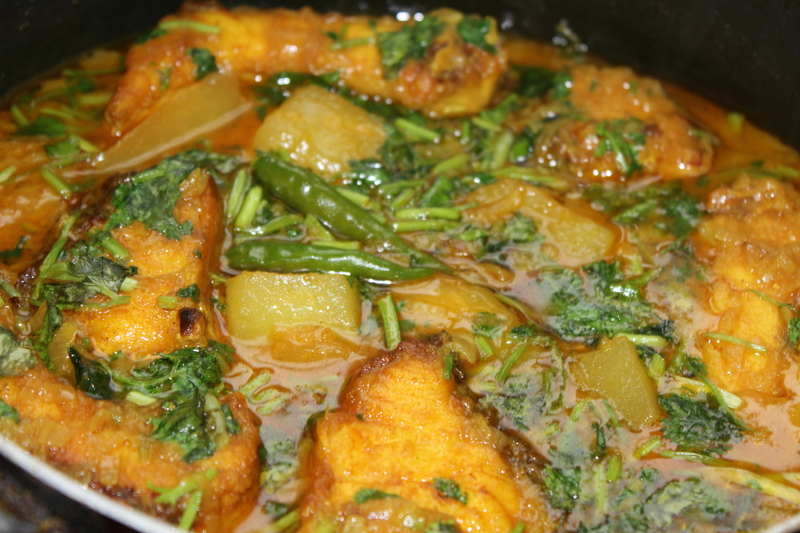 This entry was posted in Fish, Fish and Seafood, Glossary / Notes and tagged Bangladeshi Fish Recipe, Bangladeshi mach, Fish recipe, Indian Fish recipe, macher jhol, pepe -rui macher jhol, Rui mach pepe diye, rui macher jhol. Bookmark the permalink.